In the previous post, I mentioned a dessert that my grandmother, Avo L would often make. Her classic chocolate coconut cake! Recently I had the honor of actually making this cake for her, and after calling my Mom countless times to confirm ingredients and quantities it all came together. This cake brings back clear memories of running into my grandmother's house after school. Underneath her glass cake dome, this gorgeous chocolate cake would often sit, adorned with silver confectionery balls or flakes of coconut. My grandmother would give me and my siblings a sliver (and then another... and another when my Mom would pick us up for our ride home, wrapped up in a paper towel, perfect to sneak into the car!). 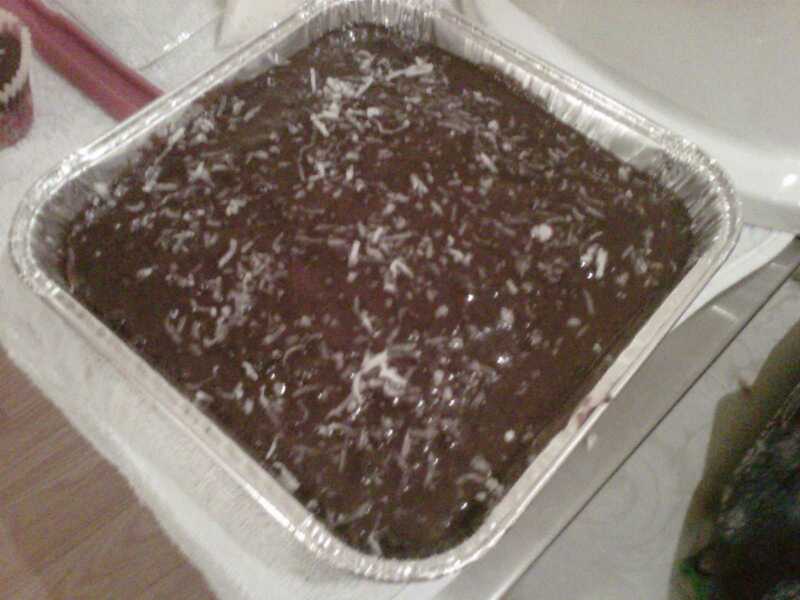 The cake itself is a blend of reduced sugar and coconut. It has a heavy consistency but the flavor compliments the texture perfectly. The flakes of coconut which abound throughout the cake, add a crispy element that in turn contributes to the overall crumbly texture. It isn't your typical light or fluffy cake, however it is the perfect dessert to be presented on its own with tea or coffee after dinner (and of course as a snack throughout the day!). This cake is a classic in my family. The grown ups always referred to it as the 'coconut cake', however the icing was enough for the kids to dub it the 'chocolate cake'! The icing is tricky. It took my Mom and I a few attempts before we figured out Avo's L's method. To prevent the icing from becoming runny, add the milk a little at a time, constantly stirring without altering the temperature. Use it immediately and do not set it aside. If your result is a little runny in the end, fear not! The icing solidifies after a few minutes. In a saucepan set on medium heat, mix half of the sugar (200 grams) with a little bit of milk at a time. You'll want a thick consistency. If you find that you are achieving this and still have milk remaining, do not worry! I frequently use between half to three quarters of a cup myself. Avo L stacks this cake and inserts a layer of the chocolate glaze in between, sprinkled with coconut flakes for added flare! This is also great made as cupcakes! Fill the cupcake liner to half so that when you ice each one after they've been removed from the oven and cooled, you can fill the remaining space with the chocolate glaze which will solidify. This will leave you with a coconut cake bottom and chocolate coconut top!